These fabrics are designed by Prints Charming, The combined talents of Cath Derksema and Kirsten Junor have ensured that there are plenty of fresh and funky Australian designed fabrics. This particular design is called Starburst in Lilac, Chatreuse and Red. The two fabrics with the white background are hand screen printed. They were purchased some time ago at Material Obsession in Sydney. The green fabric is part of their new Rainbow Gardens range of fabrics and is more widely available. 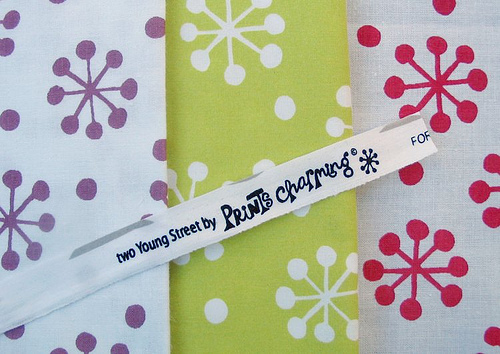 Both these talented Australian designers now create Prints Charming ranges for Marcus Fabrics in New York. I can see why you like them so much. I'm going to check to see if we can get them here and if not, I may just order online. Thanks for showing them to us. Definitely a theme going around this week! Love it, love it, love it! I have this in pink! I'm using it in my daughters birthday quilt as sashing, very cute design!